Quake® Champions Official Website | Myztro “Clawz” earns top prize at the ESWC Quake Champions 2018 finals! 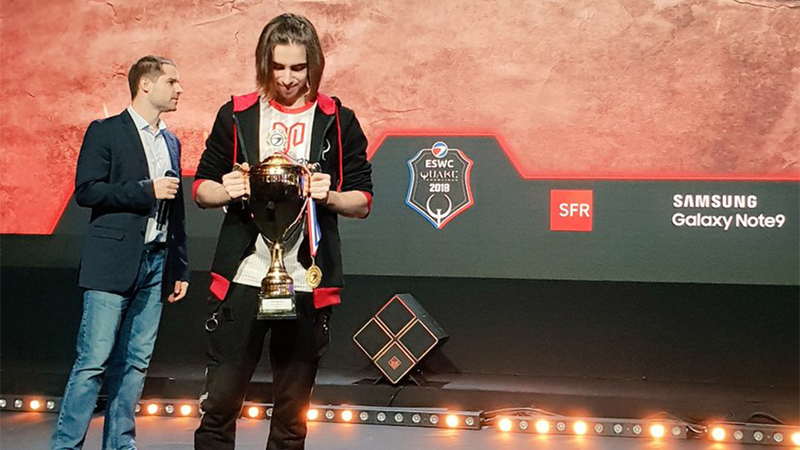 Paris Games Week has come and gone, and Myztro Nikita "Clawz" Marchinsky is leaving the festival with $5,000 and a championship trophy after placing first in the ESWC Quake Champions 2018 finals. The event brought together eight of Europe’s best Quake players to compete in a two-day Duel tournament for a cut of $10,000 in prizes. Myztro Gaming brought home ample hardware with Myztro Adrián "Raisy" Birgány earning second place and Myztro Gareth "Garpy" Marshall at third, earning the runner-ups $2,500 and $1,250 respectively. Tied for third was AMD Anton "Cooller" Singov, who also secured a check for $1,250. What’s next for Quake esports? We’re heading to Jönköping, Sweden for DreamHack Winter 2018 for the Quake Champions Invitational, featuring talent from this event such as Myztro “Clawz” and Myztro “Raisy” alongside other major names in the professional Quake Champions scene like Team Liquid “Rapha” and BIG “K1llsen.” Don’t miss a single second of Quake action by following our official Twitch and Twitter channels!